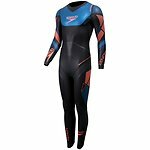 The Xenon range packs features into a wetsuit developed to boost performance, with core stabilisation, body positioning regulators combined with flexible Maximotion+ panels, for maximum propulsion. neoprene panels for supreme flexibility for your stroke. adjustment of your swim position. body, to promote a more efficient stroke. a water tight neck and extreme comfort.